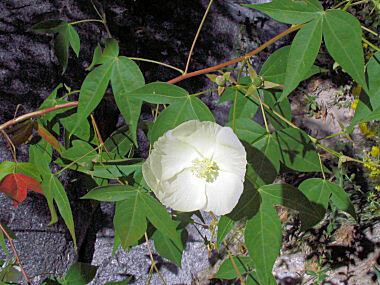 Desert Cotton is a member of the Mallow Family. The shrubby plant grows to 7 feet in height and has dark green leaves with 3 to 5 leaflets to 7 inches in length. The plant typically grows on rocky slopes and in washes and canyons at elevations between 2500 - 5000 feet. Desert Cotton is a favorite of bees and wasps. Desert Cotton blooms between August and October and produces a white to pale pink cup shaped flower with 5 rounded petals to 1.5 inches in width, which usually have a pink spot near the base.